Thank you to everyone that wrote to me with suggestions for the future Changemakers interview series. For those that are new here, Changemakers is where I get to interview Australian legends, community groups, not for profits, companies and individuals that are working on great initiatives to reduce plastic and waste. I believe in sharing the work of others, because you never know how someone else's story will inspire. And I believe it uplifting to read about other peoples hard work; it's a nice reminder that we are not islands when it comes to the war on waste. Today I'm happy to introduce you to Bottle for Botol, an Australian enterprise that works reduce plastic water bottle in Indonesia. Botol is the Bahasa Indonesian word for Bottle. A fun little fact, I learnt Indonesian at primary and high school. While I'm not as fluent as I used to be, I can still read it. Bali is a popular tourist destination for many Australian's, and anyone who has been there will have seen the devastating effects plastic has had on the Indonesian island. Indonesia are one of our closest neighbours, and I find it heart-warming that a bunch of Aussies decided to set up a social enterprise, to help lend a hand and educate on the effects on plastic pollution. I hope you like their story as much as I do. 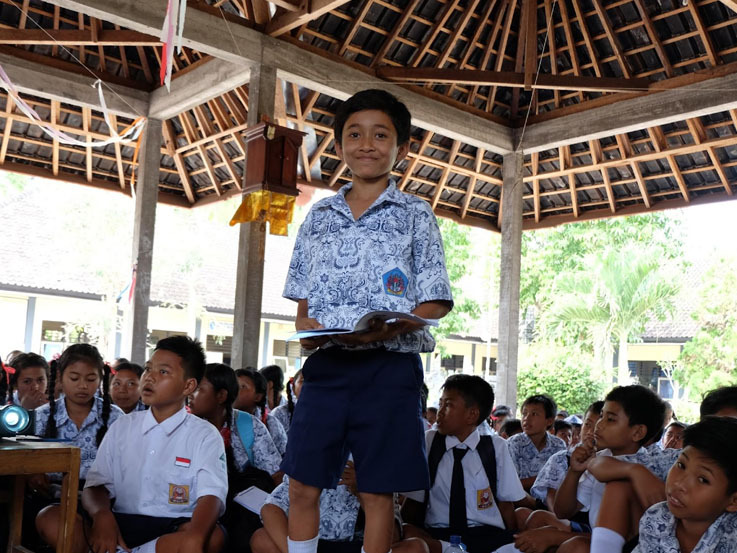 Students in West Bali finished their 8-lesson Environmental Education Program and receive their new stainless steel water bottles! What is Bottle for Botol about? Bottle for Botol is a social enterprise that works with Australian and Indonesian schools to help prevent plastic waste entering our water streams, rivers and oceans. Our program aims to educate students on the importance of protecting our environment by leading a generational change away from single-use plastics. Australian schools are partnered with Indonesian schools, creating a cross-cultural exchange. 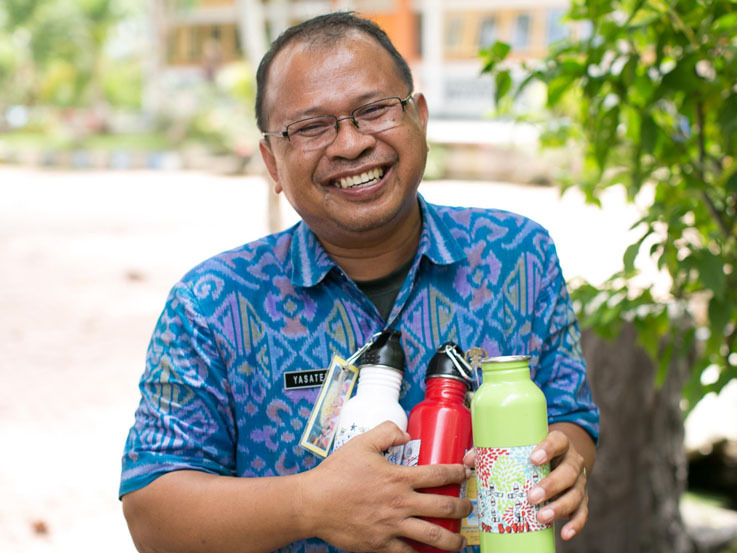 For every stainless-steel water bottle sold, we donate the same re-usable bottle to students in Indonesia, and a water dispenser for their school. The funds from bottle sales also go toward an education program about the impacts of plastic on the environment. What prompted you to start the program? Bottle for Botol was founded in 2013 by a group of Australian volunteers. While on assignment in West Bali, they saw firsthand how dire the plastic waste problem was, particularly on the beaches and in the ocean around Bali, and were compelled to do something about it. Working with Pak Yasa, an Indonesian teacher and passionate environmentalist, an education program for students was developed and piloted at Pak Yasa’s school. The pilot was a huge success in educating students and building their capacity to reduce plastic waste. The program has grown since then to include 14 schools in Indonesia, and 10 schools in Australia. One of the unique aspects of our model is rather than teach students ourselves, we train and support teachers to deliver the education program directly. What has been the challenges faced so far? One of the unique aspects of our model is rather than teach students ourselves, we train and support teachers to deliver the education program directly. Initially, we invited teachers from different schools, who were passionate and engaged in environmental education, to a group workshop outlining the program, and providing detail on issues around plastic waste. However, we found that teachers at the school who did not attend the workshop, did not understand our program. In 2016 we changed the process, and now we visit each school separately and run a workshop for the whole school community. This way everyone understands the purpose of the program and why it is important to reduce plastic waste. We have found this approach is very effective because schools often take their own initiatives to reduce plastic waste after our first visit, even before they begin delivering the lessons to students. Bye Bye Plastic Bags has been widely popular in Bali, but their success has not come without hard work. Have you found it difficult to change people's mindset on plastic bottles in Bali? 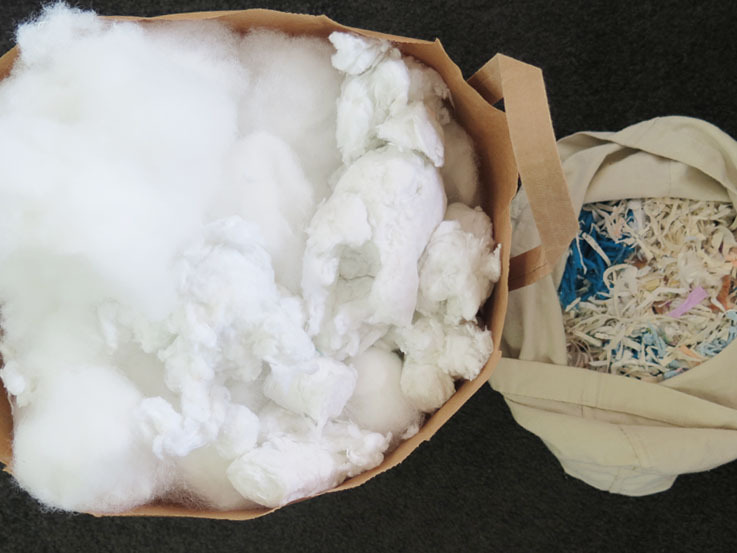 It has been wonderful to see what Bye Bye Plastic Bags’ small team of enthusiastic and passionate students can achieve, but changing attitudes and behaviors is not without its challenges. We believe our bottles, and people’s connection to them, are the key to changing mindsets. One of the questions we are often asked is “won’t the students lose their bottles?” We are very proud that, of the 960 students and teachers who have been part of our program at Pak Yasa’s school over three years, only one student has lost their bottle. The students and teachers feel proud of the bottles because they participated in the design competition and their bottles feature designs by their peers. This connects them to their bottle in a meaningful way and the everyday practice of bringing their bottle to school is an important reminder to avoid single-use plastics. What are some of Bottle for Botol's achievements so far? We currently work with 14 schools in Indonesia and 10 in Australia. To date, over 3000 students and teachers have participated in our education program in Indonesia alone. We have delivered 18 water refill stations to schools, so that teachers and students can refill their bottles with drinking water at school. We have run seven workshops for teachers and school staff. Nine students have won our annual bottle design competition and had their designs printed on bottles. Junior high school students refill their water bottles at school! Tell us Bottle for Botol's plans for the future? Updating our Indonesian curriculum to ensure it’s easy for teachers to use in the classroom, students are having fun while learning and we can better measure their progress. Building on our Indonesian and Australian school partnerships to create stronger connections between the schools. Raising awareness and increasing impact in the community by strengthening our partnerships with like-minded organisations - it takes a village! How can more Australian's get involved? Bring your refillable bottle with you wherever you go. Remember to bring it on holidays, especially if you’re heading to Indonesia. Recommend our program to an Australian school. Support us by making a donation or selling our bottles at a stall or event. Apply to volunteer with us. Join the conversation on social media, follow our blog, and support the students by sharing their stories. A student reading his work out loud from his BfB Environmental Education book! If you had a moment in an elevator and could tell people just one thing, what would it be? You can have a tangible impact on the amount of plastic pollution in our oceans, use a refillable drink bottle and purchase one for a student in Indonesia. Allow your children, and all children in the future, to have safe and healthy oceans. After posting my last update, the Plastic Bag Free Victoria campaign moved quickly. 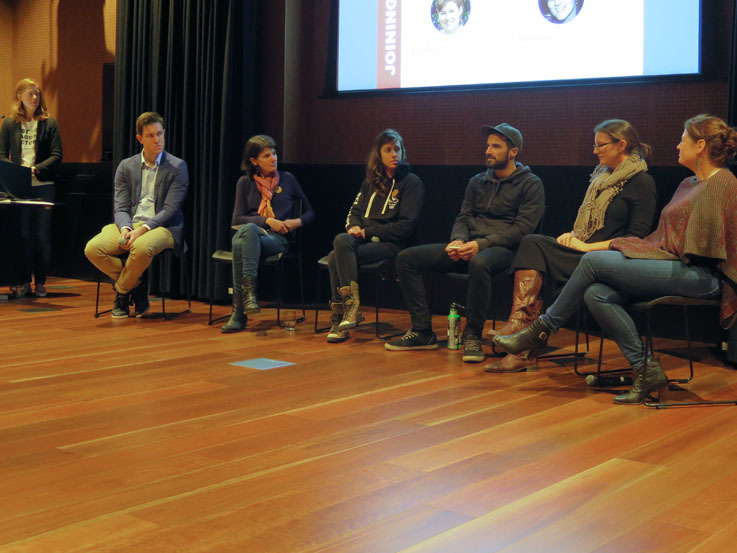 Our Plastic Free July movie and panel discussion was a success. We showed the film Bag It, followed by a rousing conversation on who should take responsibility on plastic pollution; individuals, government or businesses with our panel. The panel included Sea Shepard's Bia Figueiredo, Nicko Lunardi of Scab Duty, Sustainable Table's founder Cassie Duncan, Tammy Logan from Gippsland Unwrapped and special guest Rebecca Prince-Ruiz founder of Plastic Free July. My lovely husband went above and beyond to get food, cutlery, cups and napkins for the event to keep it plastic free. It was a packed event and our community group raised $1000. Thank you to everyone who came along. Not long after our event, we were told of an opportunity to submit our petition with a Bill that was to be put forward by Greens MP Nina Springle. Part of the protocol with petitions, is that an MP must submit the petition on our behalf. We couldn't just walk in during sitting week, throw it on the table and start chanting to a chorus of state ministers. Though it did sound appealing. For it to gain any type of traction and keep to a professional standard we had set out to achieve, we had to do things correctly. Combining the tabling of the petition with the proposed Bill (to ban plastic bags, packaging and microbeads) added strength to Plastic Bag Free Victoria's petition. With the date of the Bill submission less than two months away, we began calling in the petition pages from any businesses, individuals and groups that were collecting signatures. Our petition was the largest one to be submitted to the Victorian State Government in a decade. 11,600 signatures were collected in less than a year! For anyone that has been following along, we needed to hand over 10,000 for the State Government to take our request seriously. 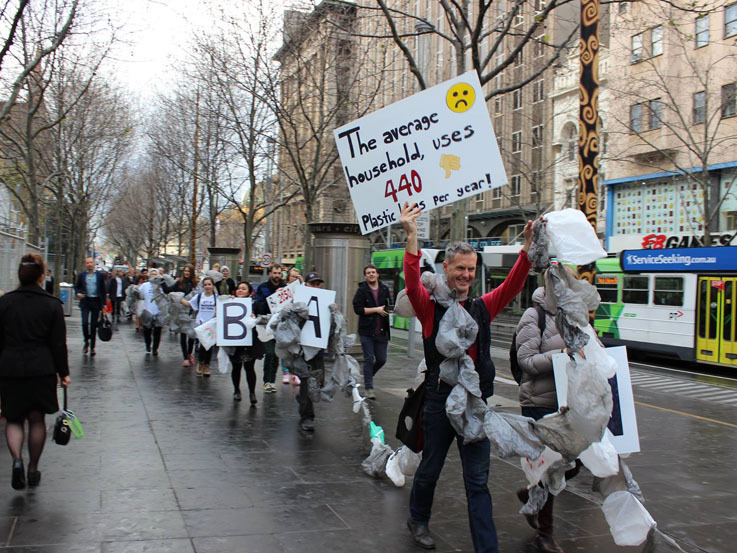 On the 17th August, 60 members of Plastic Bag Free Victoria, marched from Federation Square, along Swanston Street and up Bourke St to the Victorian State Parliament carrying signs and a plastic bag chain. The 440 plastic bag chain was to show how many bags Victorian households use on average each year. We met Green's MP's Nina Springle and Ellen Sandell, speeches were made, interviews with local media and the petition was handed over. It was an emotional, high intensity moment, for those that have been working on the campaign. Sadly, the response we received when the petition and Bill were tabled, brought us all crashing down to earth very quickly; the current Labor government declared a plan to ban bags to be too difficult. Boom. Naturally we felt angry and frustrated, especially when South Australia, Tasmania, ACT and Northern Territory have all put so called “difficult” 10c levy's in place and kept them. What was even more annoying, was that the same political party that is in government now (Labor), pledged way back in 2006 to do something on plastic bags, yet nothing was done. While the current government declared that they would not put the Bill in place immediately, our petition helped prompt the Environment and Planning Committee to hold an Inquiry into Plastic Pollution in Victoria. 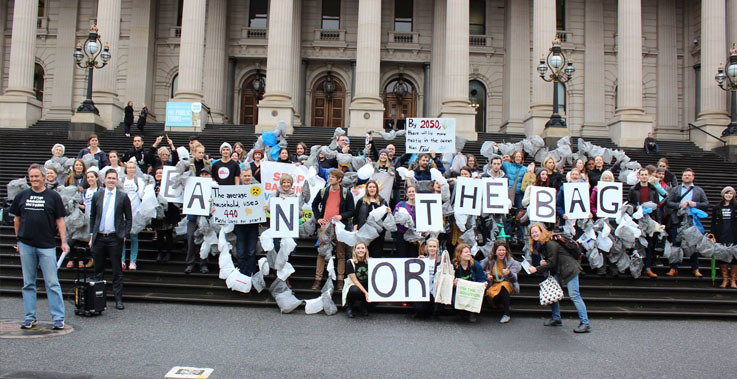 Public submissions were invited on legislation to restrict the supply and sale of plastic bags in Victoria. We saw a glimmer of hope! 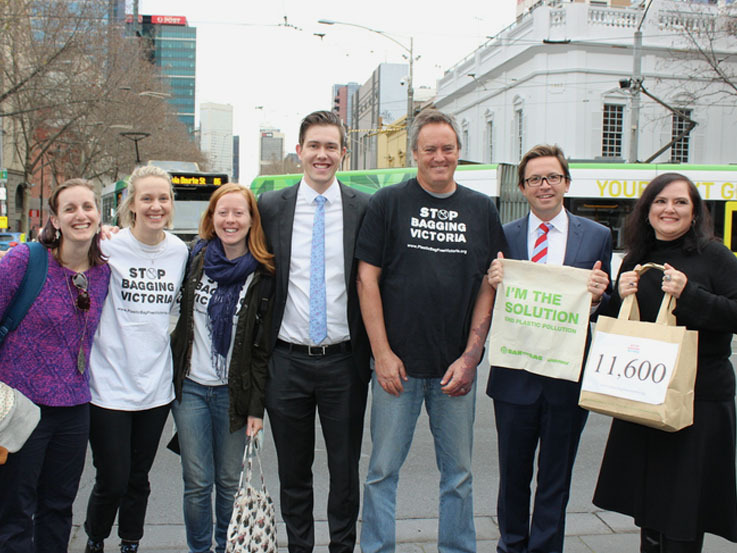 We rallied the 40 community plastic bag free groups from across Victoria that Plastic Bag Free Victoria represent. From Mallacoota in the east, to Moama in the north, Phillip Island and Torquay in the south to Apollo Bay in the West, everyone begun sending in their submissions to the inquiry. It didn't stop at the inquiry submissions, we also encouraged everyone to write letters, emails and call state MPs too. Local councils jumped on board sharing their views, pledging their support for a plastic bag ban. Business also added their voice. Soon Plastic Bag Free Victoria and other local environment groups were asked to a hearing, to share their views face to face. I could not make the hearing due to morning sickness, but I remember sitting there all day feeling like it was our teams last run into battle. As the cut off for the public submissions came, we asked the Environment and Planning Committee when the final report would be released, thinking it would be weeks away. Turns out they had received more submissions than anticipated and that we would be advised at a later date on it's release. This left me feeling optimistic, and that our efforts during the past year were not in vain. The reporting date for this inquiry is 25 May 2017. Community groups are growing and continue to spread the message. We are seeing more and more local action groups and Boomerang Bag initiatives start up across the State. There has also been movement in other areas of the country with Queensland announcing they would introduce a plastic bag ban in 2018 to coincide with the implementation of its container deposit scheme. NSW and WA is seeing little movement on the bag front presently. But like Victoria, more and more community driven action groups are doing their part to call on policy makers to listen and make a change. While we wait for the findings to be released in May, Plastic Bag Free Victoria will continue to drive conversation, write letters and encourage change as much as possible. Getting involved with Plastic Bag Free Victoria has opened my eyes to how much power we have as individuals. I shared recently on an instagram post that blogging won't change the world. It will encourage change and get conversations started, but does not hold the same weight that writing letters, organising petitions and talking with government of all levels has. The handing in of our petition was an end to a year long campaign, but hopefully it brings about a new beginning. 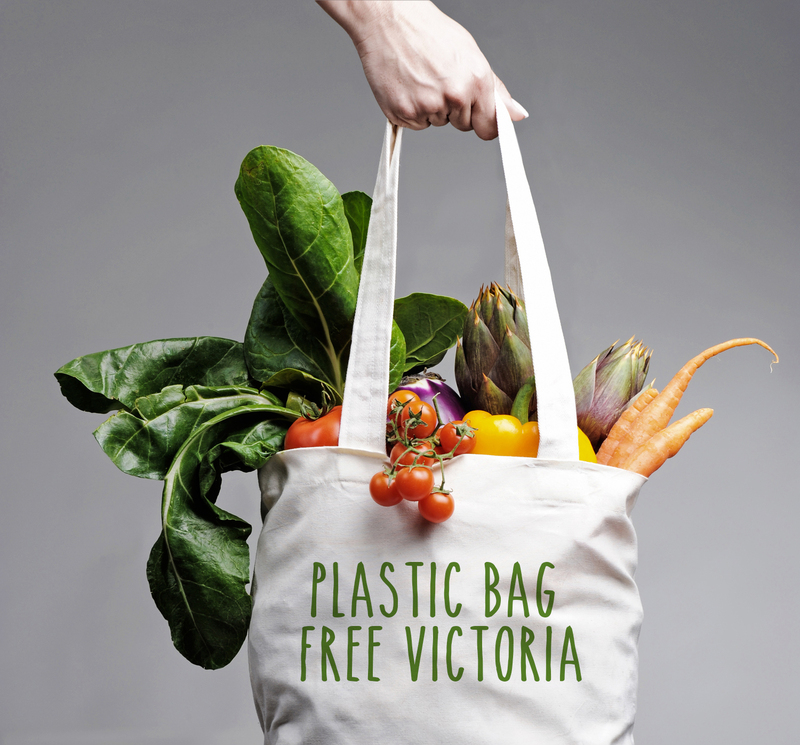 To stay up to date with Plastic Bag Free Victoria you can visit our Facebook page and website. When we made the baby announcement, I made explicit instructions to people that we don't want any new items, explaining that we would prefer to get it all second hand. Buying second hand is the way we live and have done for the past four years. This led to many people passing along items they don't use anymore. One of the biggest benefactors was my sister's family (thanks sis!). And my parents were kind enough to drive it all down to Melbourne from the Southern Highlands. In that bundle of baby stuff, were all my old teddy bears. Most of the bears are in pretty good condition for being 30 years old. They will be perfect for our son, once he is old enough to play with them. If anyone is thinking of getting us a bear, don't...as you can see below, Bub has enough to go on adventures with. Time had not been so kind to all of the bears though; missing ears, age spots and sagging body parts were sadly found on a couple of them. Passing those ones onto charity was not an option, they were too worn. If I was a kid, I'd want something looking fairly new. And I doubt a second hand store would have tried selling them. They aim to sell quality used goods, and sort through the items dumped at their stores carefully. Don't assume they sell everything that is sent there. I thought about gifting them to an animal shelter, as toys for dogs and cats. But what would happen once they were torn up, synthetic fibres strewn everywhere? Probably go into the bin. Then I sent a text to my mother, wondering if we could upcycle the bears into a new one. And by we, I mean my mum. Because my sewing skills are limited to backstitch. My mum did teach us to sew, knit, cross-stitch, embroidery etc. Regrettably I lost interest somewhere along the way. 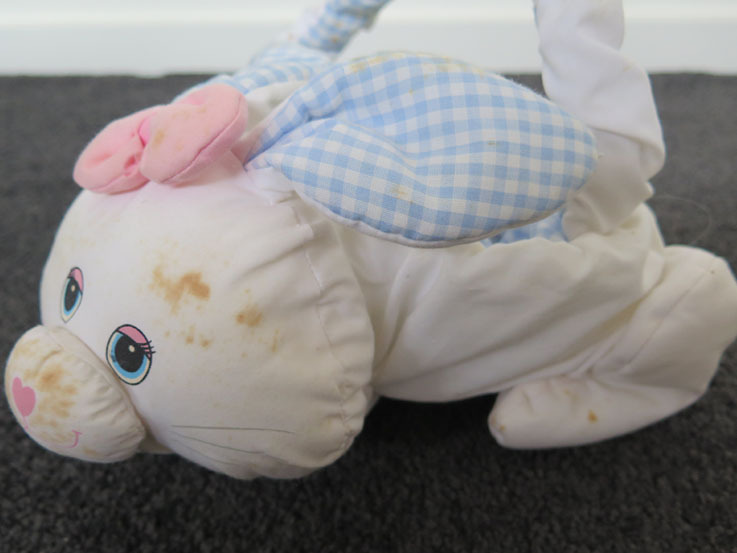 My mum is a talented lady on the sewing machine and I remembered that she made a soft doll for my sister when we were younger. Maybe she could do it again, reusing the stuffing of my old saggy teddy bears? It would be a nice present for her grandson, plus he would be getting something “new.” And I know she has a tonne of scrap fabric that could be used for the project too. So I went about pulling out the stuffing from the bears. Most of the filling was polyester, with some cotton. The casing was also cut into tiny pieces, to be used as stuffing too. The eyes were saved, along with a rattle ball. It felt very odd to be cutting up my old teddy bears. The Builder came home one afternoon, walked into the lounge room, surveyed what I was doing, then backed out of the room slowly. I would have been scared too. I'm sure this is how horror movies from our childhood started haha. My Mum is visiting this week, and I'll show her the filling so she can decided if it's usable. If she deems it not fit, then we will find another way to upcycle it. If it works, then expect a part 2 showing off our Mum's creation. 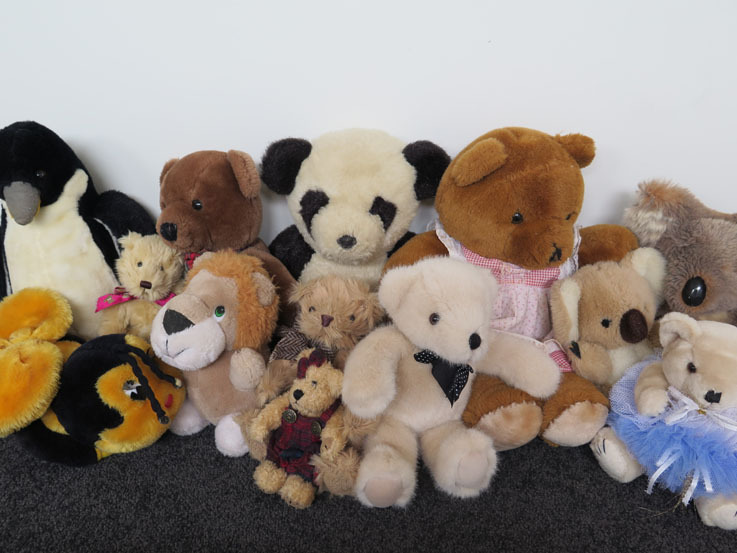 What would you have done with these old teddy bears? Would you have done something different? 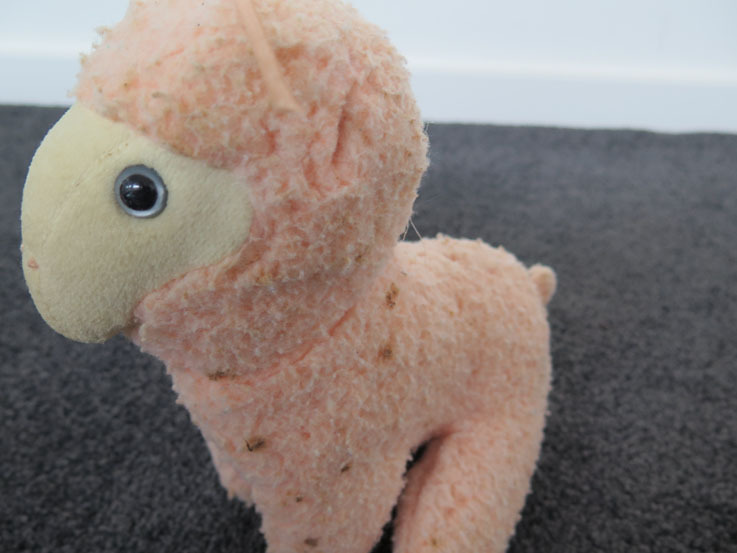 Have you made a teddy bear, doll or something similar? 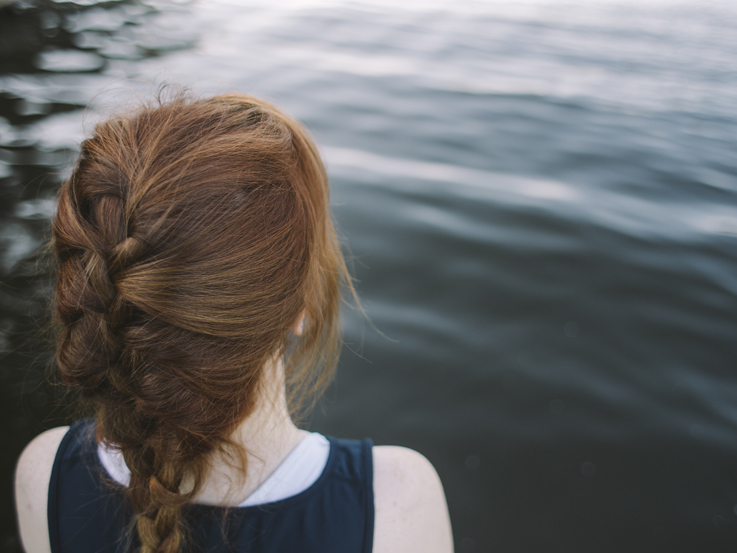 When I first went plastic free in 2013, I had to learn of a new way to live. To be more precise, it was never a brand new way of living, rather adopting tried and tested behaviours that worked well for many centuries. These age old methods have been pushed aside for assumed convenience, that has led to devastating amounts of rubbish and waste. From the outside these new habits looked brand new, simply because it was different from the modern normal that everyone around me was living. To achieve this new way of living without plastic, my success boiled down to questioning everything that I had been told is necessary. The necessary being the plastic packaged goods on supermarket shelves. Questioning everything I had been told is necessary, pointed out rather quickly how much stuff I did not need. And my use of soap is probably a good example of how far in my journey I have come over the years. Once upon a time both, myself and my husband used so many different types of soap. Shampoo, face cleansers, body wash, hand wash, foot scrub, surface cleaners, floor cleaner, bathroom cleaner…the list went on. Each one packaged in plastic, competing against each other, but all the same. As we began shopping at a bulk store, we continued to buy into the need of having separate cleaners for everything. We purchased body wash, floor cleaner, surface cleaner, liquid soap etc in our own containers. The liquid soap was used to clean dishes by hand, went into dispensers in our bathroom too. We then swapped to soap bars to clean our bodies, face and hair. Now I use a bar of soap for everything. Except shampoo, I can wash my hair just fine with water only. Shortly after, we began using the same brand of bar soap to wash our dishes. I had been using liquid soap my whole life to clean dishes, that entertaining an idea of using only a bar of soap to clean my pots and pans felt very odd at first. It has worked perfectly well, lasts far longer than the liquid soap and comes with less ingredients too. 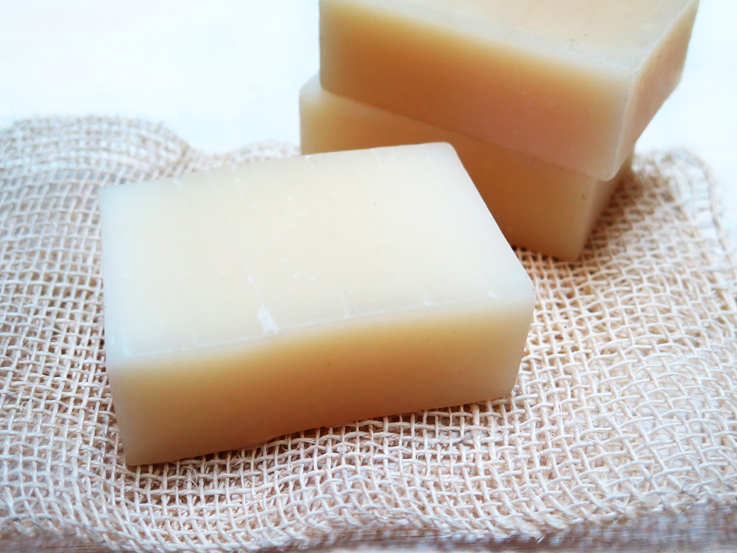 Liquid soap requires more ingredients to keep the soap as a liquid, with much of it being water. 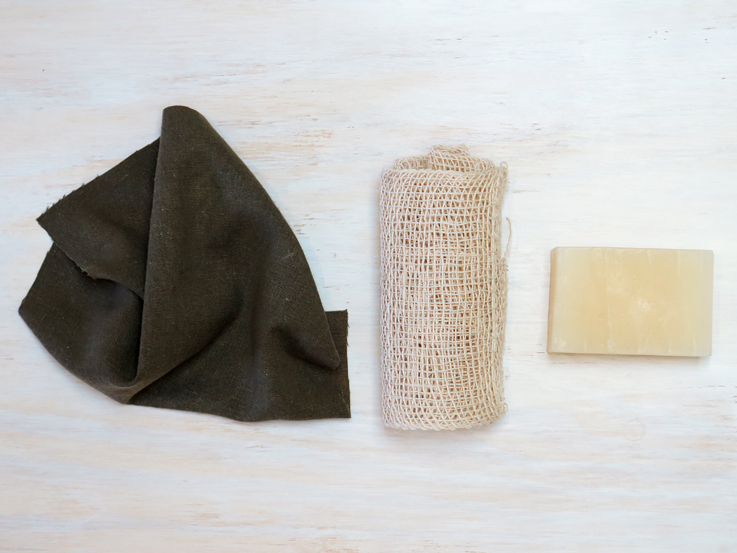 Storing blocks of soap is far easier, going into old socks, tucked away into our clothes draws. A simple bar of soap. It’s nothing fancy, made using olive oil with a humble cost of $2.50 a bar. It’s vegan and locally made, with ingredients sourced from Victorian farmers. We scrub the dishes clean with cotton cloth, cut from an old pair of cotton pants and use this agave scrub from Biome also. The agave scrub works well to get rid of baked on bits. But if i'm struggling, then bicarb or salt works perfectly in those situations. I'm trying to find a similar scrub made here in Australia, any tips? I don’t have bottle brushes, as we don’t use bottles for anything but water or tea. Our liquids are stored in jars, and we can reach our hands in there to clean them with our cleaning cloths. If the jar is too slim for the Builder, I can get in there to clean it with my tiny hands. Each week the kitchen dish cloth and agave scrub cloth are tossed into the washing machine with everything else. After six months, the cloth goes into our compost while the agave scrub cloth will end up as a scouring rag, to help clean shower glass in the bathroom. Synthetic sponges and other weird liquid soap dispensing cleaning apparatus release synthetic micro fibres into our oceans and won’t break down in my compost the way cleaning cloths made of 100% natural fibres will. I love that each of my cleaning cloths will break down within three months and not sit around for thousands of years. HOMEMADE LIQUID SOAP RECIPE / Combine one and half litres of water with one bar of grated soap into a pot, and heat on the stove top. 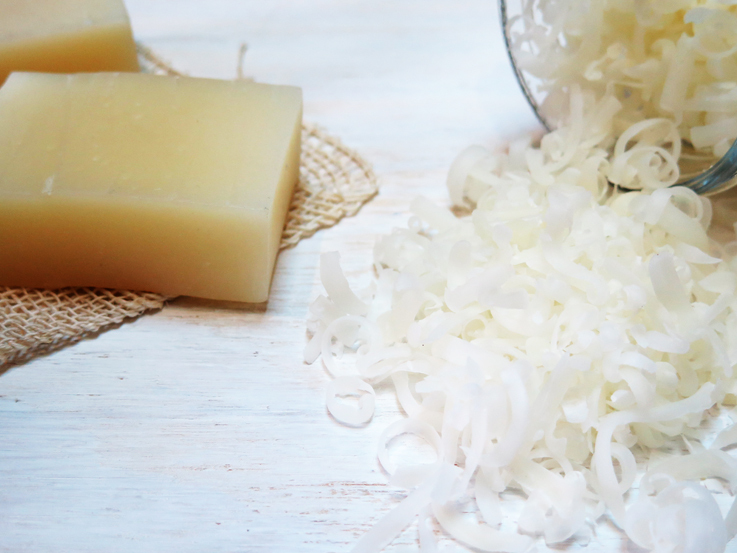 Stir the water and grated soap, until the soap has dissolved. Transfer the liquid to an old bottle and let sit over night. Pour into your chosen dispenser. Handy tip > If you are making this for the first time, before pouring into the bottle to set, pour into a bowl and make a judgement the next day if its too thick or not to your liking. It will be easier to get it out of bowl compared to bottle if its too thick. You want it to be a runny liquid. We continue to buy eco dishwashing powder for our dishwasher at the bulk store though. Over the years we have had conversations about the dishwasher – is it truly environmentally friendly? Do we need it? Is it cheaper? It's not used too often but enough for us to query its existence. After three years we pared back our cleaning to a simple bar of soap; perhaps selling the dishwasher will happen one day. Or maybe not with a child on the way. Only time will tell. I’ll share the details later, on how we clean the house with a bar of soap. Right now, the sun is shinning, and I’m going to enjoy it. How do you feel about dishwashers? Or do you do it all by hand? Are you like me and do half by hand, half for the dishwasher? I'd love to know if you wash your dishes with a soap bar too. Are you living off the grid? Do you grow all your own food? Why would you have a child? It's not environmentally friendly. How can you live in a city and be an environmentalist? Do you fly in airplanes? Do you offset your carbon? Do you use family cloth? You can't care about environment and vote for anyone but the Greens, right? The above are examples of the type of questions, I have received over the years. The questions are usually asked as a test, to find out how much I truly care about the environment. And it's not just me. I have witnessed others cornered by the same inquisitions. I used to loathe being called an environmentalist. It's a term that I never identified myself as. But over the years, I've slowly cared less about the label people will brand me with. Our society likes to put us into boxes, not for the reason of reducing someone to an ideology, rather I believe its more for ease of use. But what does frustrate me, is that if you are labeled an environmentalist, there are certain boxes that must be ticked or people will say your not trying hard enough. I want to bust this. Why? It's simply not fair. If anything, these assumptions are limiting, and it means the conversation is owned before it has begun. Doors are shut and people are divided. There will be people who can answer these expectations, earning them a green tick of approval. And that's great. I applaud those people. But in no way should someone who does not have solar or live 100% vegan be made to believe they are not doing enough. That very person, whose having a finger pointed at them, just might not be there yet and who knows, they could invest in solar, go vegan and ditch their car when it's right for them. I believe in doing the best you can, with what you have got, where you are. Next time someone asks you a question, tell them the truth. Tell them that you're not ready to afford solar yet, but are an environmentalist and are doing your best. The same could be said for the zero waste and plastic-free movements. If you are not ready to try a menstrual cup, but are doing what you can to reduce plastic use in other areas, then a high-five to you. Your journey should be celebrated. No one owns the environmentalist label. The far left don't own it. It just happens to be where the majority of environmentalists are for now. I am an optimist, and believe that a greater love and respect for the environment can one day diffuse socially through all areas, all political parties. I truly believe small changes lead to larger changes, and those smaller steps make you no less of an environmentalist than any one else.